Today was my first day beginning my summer break. I took my last final of the semester yesterday and felt confidant that I aced it. I gave it a few hours before I checked my overall grades and saw that I made an A in that class which is Cultural Anthropology. Anthropology is what I decided that I would be majoring in. I’m even more excited to see that I received another A and a B in two other classes. I’m still waiting to see what I received for one more class, but I have a feeling I did very well. My GPA even went up, which makes me happy. I even registered for five more classes for next semester. Now with school being over I can relax and enjoy being stress free for awhile. Most importantly, I can now spend the time that I want with my daughter. Today she told me that she wanted to go outside and play, well, not in so many words, but with gestures and with her putting her shoes on and running to the door. I grabbed my purse, a bottled water, put my shoes on, and went outside. 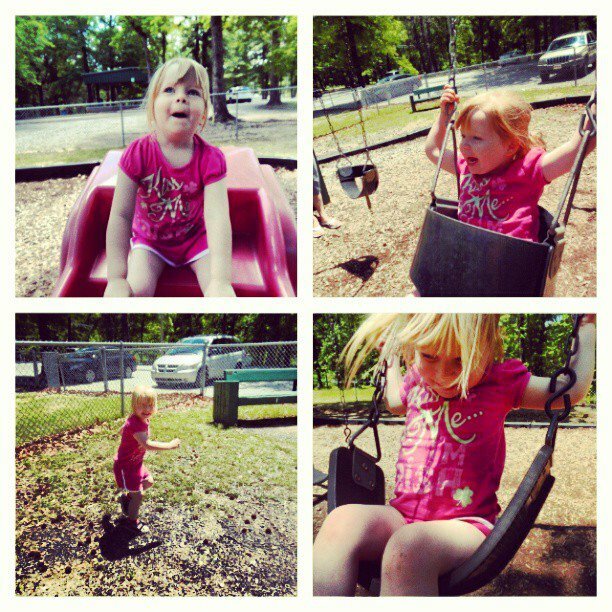 Instead of playing on the swing set in our backyard, I decided to take her to the park down the street. One thing I can tell you that if you ever decide to go to the park with an energetic three year old, wear tennis shoes and not flip flops. My calf muscles burned after running around the playground with her for a half hour. She then wanted me to take her for a walk around the foot path trails that go around the perimeter of the park. I decided that the half we walked was at least two miles. It did feel good to go for a walk, especially after several months of sitting being a computer researching and typing essays almost daily. From the lack of exercise I noticed that I had put on a few pounds, which is something that I am not comfortable with. I haven’t had much luck in losing these extra baby pounds due to my lower back pain, so putting on more weight makes me feel even more depressed. I am planning on doing a lot more walking this summer, though I plan on having my little girl with me. This entry was posted in Blog, My daughter and tagged children, college student, family, parents, playgrounds, single mom, summer, toddlers on May 11, 2013 by JenniferNAdams.